There aren't enough food, service, value or atmosphere ratings for Ponzu, Illinois yet. Be one of the first to write a review! 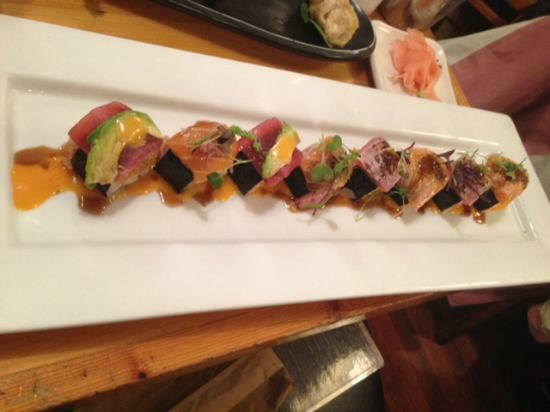 Crispy sushi rice on topped with spicy tuna, avocado, pico de gallo, spicy mayo and house made eel sauce. Seaweed topped with ponzu sauce. Deep fried pork pot stickers. Wok stir fried chicken and various vegetables with rice. 3 pieces of tiger shrimp. Deep fried octopus balls, topped with 7 spice mayo, lemon dressing, and yaki sauce. Lightly kosher salted warm soy beans. Wok stir fried kimchi and bacon with rice. Japanese shrimp dumplings. Steamed or deep fried. Japanese soy bean paste soup. Wok stir fried noodle with various vegetables. Add tofu, chicken or shrimp for an extra charge. Entrees prepared with miso soup and house salad. Maki Roll Additions ($1): Avocado, Cucumber, Spicy Mayo. Grilled salmon and various vegetables with house made eel sauce. Grilled chicken and various vegetables with house made eel sauce. Maki Roll Additions ($1): Avocado, Cucumber, Spicy Mayo. Fresh tuna, cucumber, and spicy mayo. Imitation crab mix, cucumber, and spicy mayo. Baked fresh water eel, cucumber, scallion, spicy mayo, and house made eel sauce. Deep fried soft shell crab, spicy mayo, scallion, avocado, cucumber, house made eel sauce, and wasabi mayo. Fresh salmon, cucumber, and spicy mayo. House made sweet soy sauce marinated shitake mushroom. Deep fried sweet potato, spicy mayo, and teriyaki sauce. Avocado, shitake, cucumber, and asparagus. Fresh tuna, spicy mayo, cucumber, tempura flakes, house made eel sauce, crunchy sweet potato flakes. Imitation crab mix, spicy mayo, cucumber, tempura flakes, house made eel sauce, and crunchy sweet potato flakes. Spicy crab mix and cucumber topped with chili tuna, house made eel sauce, and lemon dressing. Kanikama, cucumber, spicy mayo, and tempura flakes topped with spicy crab mix and house made eel sauce. Spicy tuna, cucumber, topped with sliced avocado and house made eel sauce. Shrimp tempura, imitation crab mix, and cucumber topped with spicy tuna, house made eel sauce, spicy mayo, and crunchy sweet potato flakes. Imitation crab mix, cucumber, and avocado topped with tuna, salmon, escolar, sliced red onion, house made eel sauce, and lemon dressing. Imitation crab mix, cucumber, avocado, and sweet almond topped with fresh escolar and house made eel sauce. Fresh salmon, spicy mayo, cucumber, tempura flakes, house made eel sauce, and crunchy sweet potato flakes. Fresh salmon, fresh yellowtail, scallion, cucumber topped with fresh tuna and tri spicy sauce. Shrimp tempura, cucumber, cream cheese, baked fresh water eel, scallion, avocado, asparagus tempura, tempura flakes, house made eel sauce, and wasabi mayo. Fresh tuna, fresh salmon, fresh yellowtail, avocado, jalapeno, cilantro, cucumber, ponzu sauce, and house made chili oil. Fresh tuna, fresh salmon, fresh escolar, asparagus, cucumber, avocado, jalapeno, and cilantro wrapped with soybean paper, ponzu sauce, pico de galo, and house made chili oil. Spicy tuna, imitation crab mix, cucumber, asparagus tempura, avocado, and tempura flakes wrapped with soybean paper, house made eel sauce, and wasabi mayo. Fresh tuna, cucumber, avocado, scallion, jalapeno, spicy mayo, and tempura flakes topped with chili tuna, sliced jalapeno, house made eel sauce, and crunchy sweet potato flakes. Spicy crab mix, cucumber, and tempura flakes topped with chili tuna house made eel sauce, spicy mayo, and crunchy sweet potato flakes. Small restaurant but is not lacking in good service & great tasting food. We ordered pork gyoza, shrimp tempura and chicken yaki soba. We had a cosy window table. Food tasted great and service attentive. Nice little find. Tiny spot but good service and fresh delicious offerings in a very busy area. 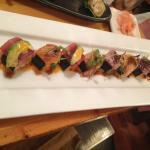 Menu has all that is needed for sushi lovers and has some unusual items as well. Nice atmosphere. Worth a stop. Get quick answers from Ponzu staff and past visitors.